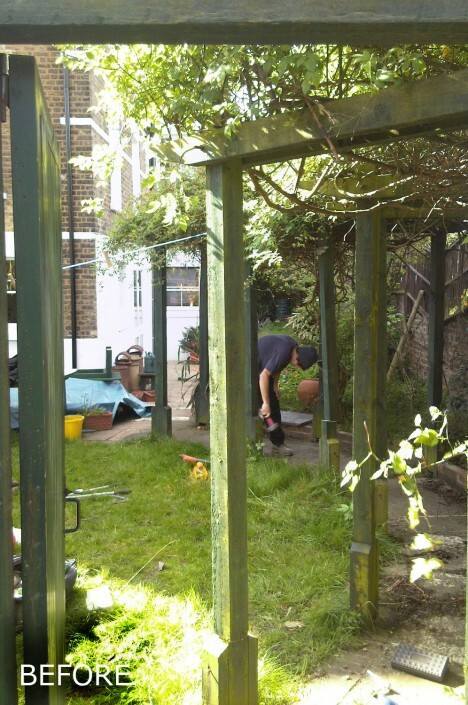 Modern, low/medium maintenance garden landscaping (South London SE22). 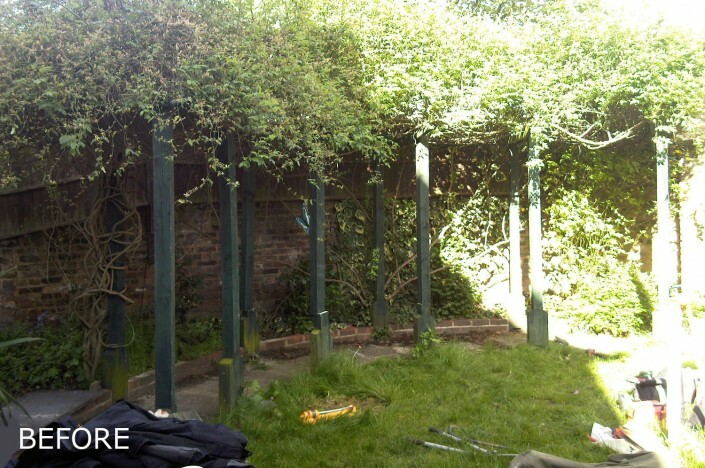 Brief: The clients are very busy working professionals with two young children. Their house had recently been modernized. Its interior was minimalist and contemporary in style. They saw their garden as a potential to create more living space. 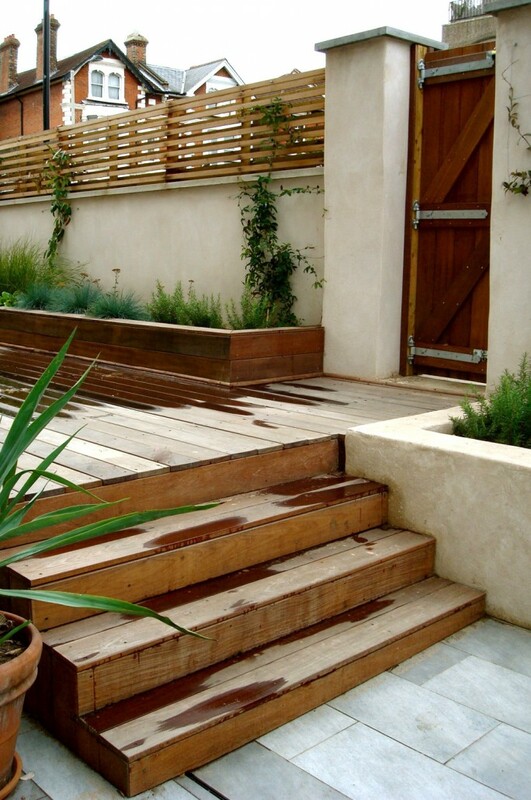 They wanted to be able to flow between their internal and outdoor living. 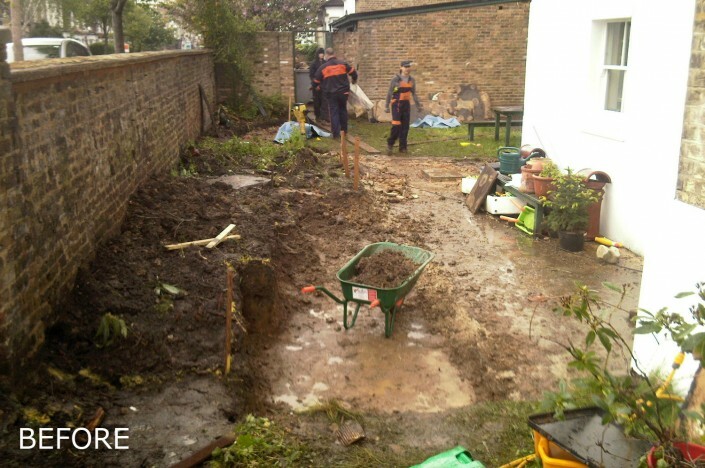 Creating individual areas in the garden was important but the garden had to remain open so that the children had space to run around. We proposed bringing the indoors to the outside by using exterior tiles that matched the colour of their internal flooring. This would create the continuity they were looking for and maintain the contemporary clean lines that they had already created in their home. 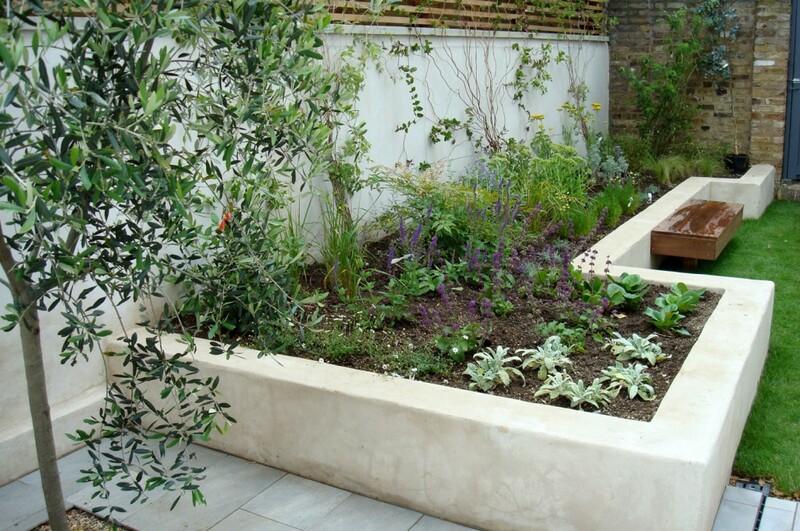 Wanting a Mediterranean feel, we created block work raised beds and rendered them with silver sand and snowcrete. 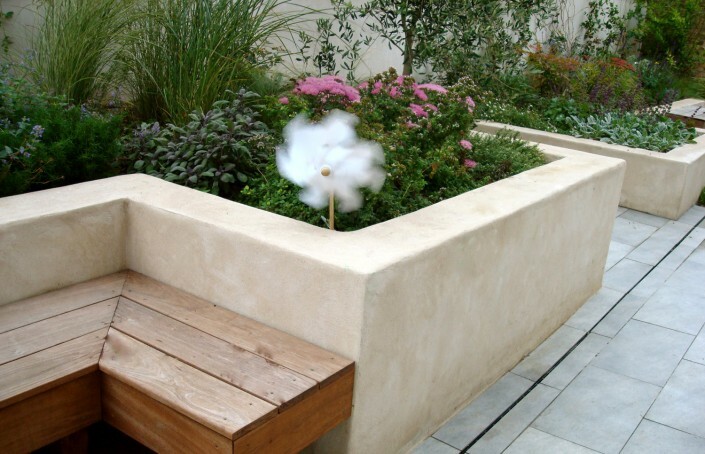 Silver sand is more reflective and in our opinion more softening than white render. The raised beds were designed in a geometric, staggered pattern to brake up the long, awkward side return. 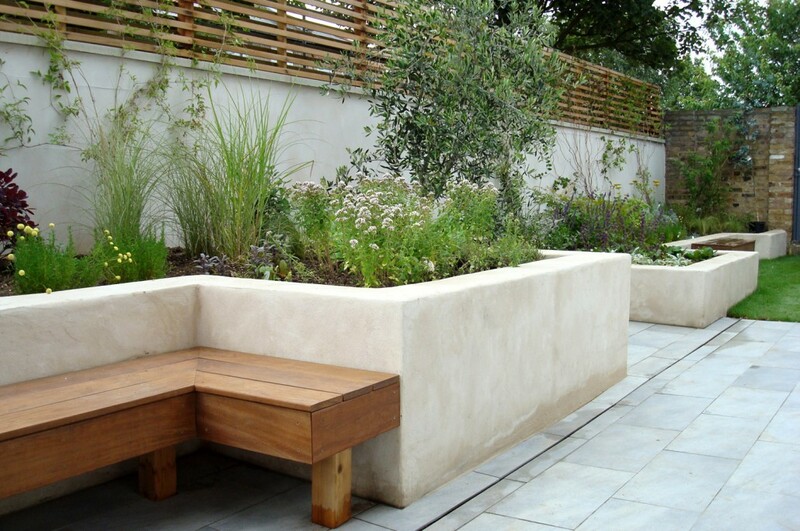 Bespoke wooden seats were built and placed at strategic points of the garden. The beds were planted with Mediterranean plants that could cope with a certain amount of drought. Lots of herbs and plants loved by bees and insects were chosen to create a plethora of smells. 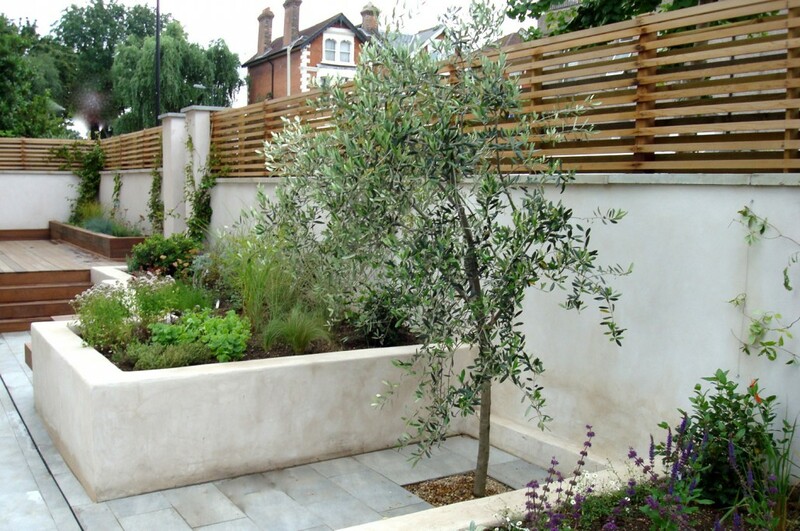 A mature Olive tree was planted to add visual height. 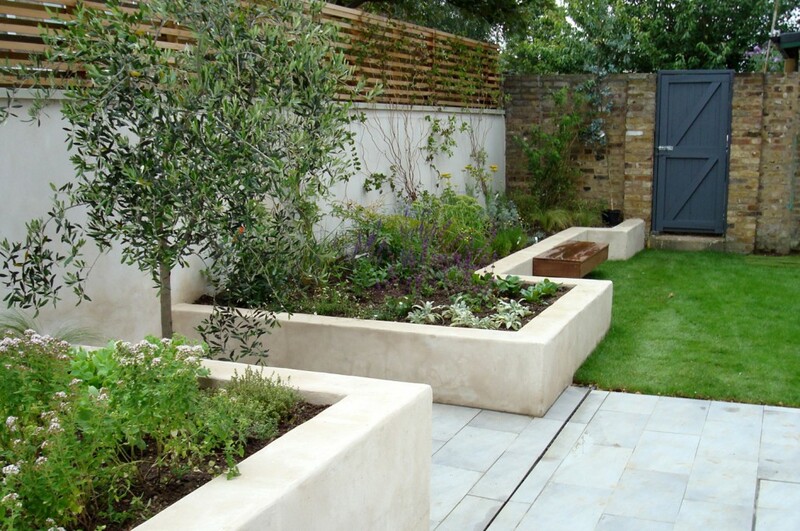 The original boundary brick walls were also rendered to add a dramatic backdrop for the colourful planting. For the children, a raised deck area with and integral sandpit and raised bed for planting, was designed and built. Although individual areas were created to accommodate everybody’s needs, an open flowing space remains for the children to run around around in.